I am awestruck by the delight of this container as I walk the earth here. The fertile ground beneath my feet. The lush landscape that surrounds me. The fortitude of the fence that holds my structure here without the slightest sense of confining me. The way that I am easily able to understand what is mine and what is not. I remember the times before it felt this way when my inner landscape felt like a plot of land available for anyone to trespass upon it. When I routinely hopped the fence into someone else’s realm of responsibility and left my own plot to its own devices. During that time my inner landscape bore the unmistakable signs of neglect. The gardens were overgrown. The fence was crumbling. The flow of energy and traffic was rampant, running over my non-existent boundaries. Nothing was mine or sacred. Everything I had was available for use. When I teach I talk about your realm of responsibility this way. As if your inner landscape were the lush, vibrant ecosystem I know it can be. I talk about tending to yourself the way you might tend to the land – by digging your hands into the dirt and devoting yourself to your own upkeep. I talk about fences not because I am overly concerned with land ownership, but because they are a convenient metaphor to help you understand when you are operating within your realm of responsibility and when you have hopped the fence into someone else’s territory, taking responsibility for something that is not yours to own. Your responsibility is your words, behavior, actions, efforts, mistakes, ideas, and consequences of your actions. 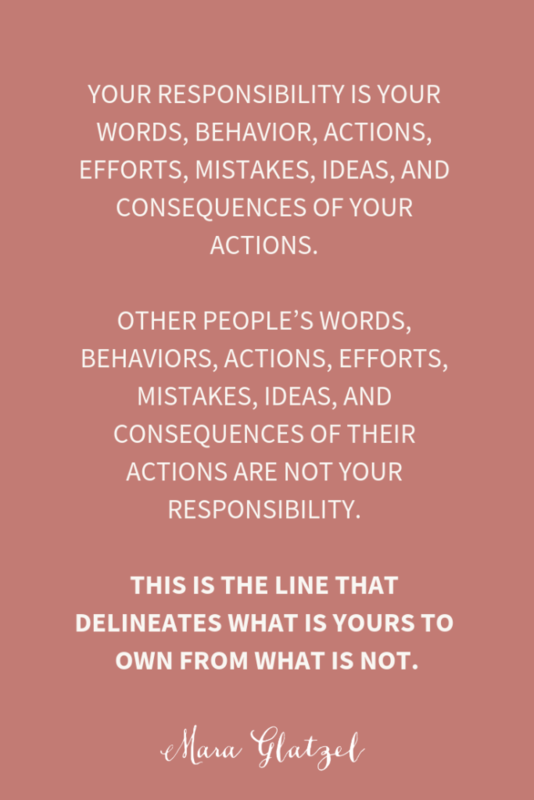 Other people’s words, behaviors, actions, efforts, mistakes, ideas, and consequences of their actions are not your responsibility. This is the line that delineates what is yours to own from what is not. This is the fence between even the most intimately adjacent properties of lovers, families of origin, and children. This is what is mine to tend. I notice that respecting this boundary enables me to protect and maintain my energy so that I might put it to good use in my life. To pour into the projects that are most meaningful to me. To wash the sheets and bake the bread. To risk the vulnerability of being my truest self in my relationships. To rest, knowing that I can trust others to take responsibility for what is theirs to own – even if I feel profoundly uncomfortable about how they go about handling that responsibility. To feel my own discomfort and know that I can feel a feeling without making it mean I need fixing. My greatest work is in eradicating the lie that I must do it all or be everything to everyone in order to earn my rest, peace, and care. I can do this gently, both hands in the dirt feeling for unexpected places where this lie might still be deeply rooted. My greatest work takes place in tending to this realm within my boundary, making it as beautiful and lush and vibrant as possible. Inviting others in for tea light lit dinner parties and early morning coffee dates. Owning what is mine to own in order to co-create the world I am here to co-create. My greatest work is padding around this corner of earth, taking responsibility for what is mine to own with grace, grit, and an awesome sense of my own personal power.